Is there anything more appetizing than a potato timbale? A potato timbale with a maritime touch! Just like this one, sent to us by Pilar for our recipe competition. 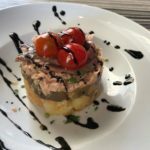 Potato, aubergine, Cantabrian anchovies, yellowfin tuna... A delicious “salad” presented in a timbale! Roast the aubergine, scoop out the flesh and set aside. Roast the potato then peel and cut it into pieces. Set the pieces aside. Put a circular mould on a plate and fill the base with the roasted potato. Add a layer of roasted aubergine. Add a layer of tuna, drained of olive oil. Finally, we add Cantabrian anchovies, drained of olive oil. Garnish with cherry tomatoes and seasoned with balsamic vinegar. Sprinkle on chopped parsley and enjoy! Yellowfin tuna fillets, carefully selected by Conservas Serrats and covered with olive oil.